I'm using Royal Brown SR03. It's a pinkish brown and creates the impression of very gentle eyes. I thought it would be super gentle and cute if someone with a monolid placed the pink shade on the outer corners. I don't really like glittery, shimmering eyeshadows but this is matte and has very fine shimmer so I definitely recommend this for daily makeup. The shades are pigmented and they also don't fade. I like how it keeps its finish for the whole day. I also want to try other colors. When it comes to cheap brown colors, Excel is my go to. [Update] I bought the new color, SR06 Sensual Brown. Compared to 03, this has more of a red brown and looks very elegant. Since Fall clothes tend to have darker colors, if you want to really define your face, this eyeshadow would be perfect. My eyes tend to come off as too strong, so I don't use the darkest brown and take shade 2 on the outer corner of my eyes. The red brown looks so pretty. I think this would be my main eyeshadow for the Fall. I bought SR06. I was waiting for a shade from Excel's Skinny Rich series that matches with cool undertones! I'm so happy ☆★☆ Personally, I feel like it's similar to SUQQU'S 04 Ayanadeshiko. The bottom right color is brown for this, and SUQQU has a reddish bordeaux shade. Even though the prices are different, both products are easy to use. And, the finish is just beautiful. This is my first product fromm Excel and when I flipped the product, it said Noevir and I found out Noevir's cheaper line is Excel. I like how it's also made in Japan because it feels safe to use. I think this would suit anyone with both cool and warm undertones. I finish off with my Kumano brush and it doesn't crease, it's pigmented, and has a very elegant shimmer. And for this price, it's amazing. For this price, this is so good!! I bought SR06 Sensual Brown. I bought this a while ago and I use it every time I do my makeup but there's still a lot left. A little goes a long way with this because it's so pigmented! It doesn't feel too powdery and has a bit of a glow. It also has glitter, but it's not too much and the perfect amount of shimmer. Also, this has 4 shades but you can use all of them. I use the white and pink shade on the top row for under my eyes. Also, sometimes I just use the pink on the right top or use all shades for a gradation, or I just take the dark brown shade for the whole eyelid. It's so nice I can change up my look depending on my mood! It also lasts long and the darker shades stay on the whole day. I always get bored of eyeshadows and kept on buying new ones, but every since I started using this, I don't really think I want a new product. ........well I realized that when I was writing this review lol There's other eyeshadows I have my eyes on but this is just a nice product to have. I bought 03 Royal Brown. At 1600yen, I can't believe how good the powder quality, how much it lasts and how good the color pigmentation is! This was the eye shadow I've been looking for!! (Lol) In addition, Royal Brown is a bit reddish and tinted with brown. It can make you look cute in a sophisticated way. I am super happy I can have a clean 4 color gradation!! If you're curious about it, I recommend you try. Since it is so cheap, I want to try out the other colors! I was interested in it as I saw high reviews at @cosme so I tried the new color of warm brown. I bought to try it out. The main color is orange so it is very easy to use this color. The color pigments are good and it is perfect for everyday use as it looks natural. The powder is of good quality. It does not fly off. You can't find it at this price. 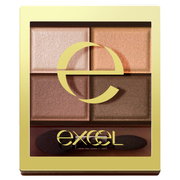 I am quite impressed with the excellent products of Excel cheap cosmetics. Even this, I can't believe is 1500yen. It's not much different from 5000yen or more eye shadow. Selfishly speaking, I want a few more colors for the base color... If it were to be a bit more generous, this would be the best.